New Delhi has asked Dhaka to take strong action against the Bangladeshi criminals who had attacked BSF personnel. New Delhi will reiterate this issue when Border Security Force (BSF) chief will sit with his Bangladesh counterpart in New Delhi from Monday. India will raise six vital points when the two sides sit for the 47th Director General level co-ordination meeting. Other major issues New Delhi will raise include joint efforts to prevent trans-border crimes, action against IIGs (Indian Insurgent Groups). “We will raise issues related with border infrastructure, Joint efforts for effective implementation of CBMP (Comprehensive Border Management Plan), simultaneous Coordinated patrol (SCPs), identification of vulnerable areas, sharing of Information as well as Confidence Building Measures,” a senior BSF official said. Indian delegation headed by KK Sharma, Director General, BSF will hold discussions with the Bangladesh delegation headed by Maj Gen Md Shafeenul Islam, Director General of Border Guard Bangladesh. “Relations between India and Bangladesh is at all-time high. To enhance cooperation and mutual understanding between the two border guarding forces, both sides are carrying out various events for officers and men on reciprocal basis under confidence building measures. In addition to it Coordinated Border Management Plan is also being implemented by both the border guarding forces as force multipliers in checking trans-border crimes,” the official said. The concluding session and signing of Joint Record of Discussions between the DG BSF and DG BGB will take place on Friday. The official said that the Bangladesh side will also raise issues related to trans- border crimes, smuggling of various types of drugs and narcotics from India to Bangladesh, arrest and apprehension of Bangladeshi nationals by BSF, construction of viewers’ gallery and other facilities for joint retreat ceremony venues, expansion of Crime Free Zones as well as confidence building measures. Since 1975, the bi-annual DG Level Border Co-ordination conference with BGB is being held to discuss the matters of imminent concern. 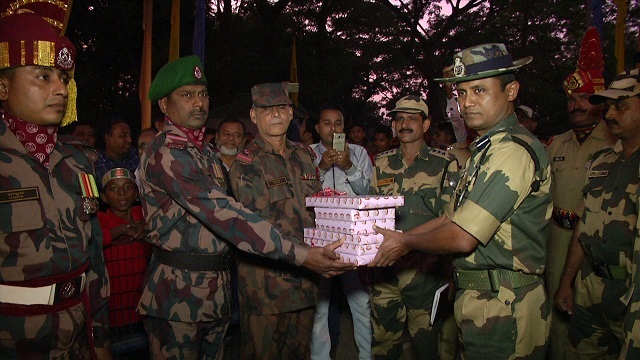 The last DG Level Border Co-ordination conference between BSF and BGB was held in Dhaka.